“Yuletides of Yesteryear” will be held Nov. 14 and Dec. 1, 7, and 8 at Sauder Village in Archbold. Reservations are now being accepted for the Sauder Village “Yuletides of Yesteryear” Holiday Lantern Tours, to be held Nov. 24 and December 1, 7, and 8 in Archbold. The traditional tours offer guests an interactive look at American Christmas traditions from 1850 through the 1920s. 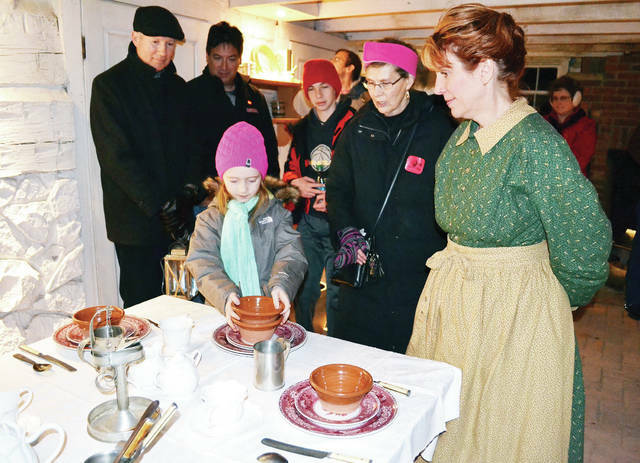 The Holiday Trolley will stop at Pioneer Settlement Area, where guests will visit the Witmer-Roth Home to help set the table and learn about historic holiday food recipes as we prepare for the Christmas meal. At the Peter Stuckey Home, guests will learn how the home was decorated for the holidays, make a craft, and learn about holiday gift giving. The holiday trolley will move into the modern age as guests visit the Elmira Depot to browse through Sears Roebuck & Co. catalogs of yesteryear while learning about train travel in 1920. The last holiday trolley stop will be at the Grime Homestead, where guests will be dazzled with 1920s holiday decorations, help decorate a tree and frost cookies in the kitchen. Finally, guests will walk to St. Mark’s Lutheran Church to learn about and sing favorite holiday carols. The “Yuletides of Yesteryear” Lantern Tours last approximately 90 minutes, and are repeated every half hour from 4-8:30 p.m. The cost is $13 for adults, $7 for children. Children five and under are free, and member discounts are available. Pre-registration is required for this evening program. Call or visit the Sauder Village website to register. For more information about Holiday Lantern Tours call 800-590-9755 or visit www.saudervillage.org. https://www.fcnews.org/wp-content/uploads/sites/45/2018/11/web1_yuletides-of-yesteryear.jpg“Yuletides of Yesteryear” will be held Nov. 14 and Dec. 1, 7, and 8 at Sauder Village in Archbold.